In most Canadian provinces, recycling programs are run by municipalities and funded through the tax base or user fees. The sale of recyclable materials by municipalities – especially old newspapers (ONP) and aluminum, brings in a substantial revenue stream, and in an efficient system, covers the program costs. Product stewardship is a product-focused approach to protecting our environment. The core principle of product stewardship is that whoever designs, manufactures, sells or uses a product has a role both in managing its end-of-life and in minimizing its impact on the environment. Many provinces have adopted stewardship models. It is somewhat different in each province, however there are strong similarities in how newspapers are treated. This approach is consistent with how newspapers are managed in recycling regimes all over the world. Newspapers have been treated differently because of the recognition that they provide a public benefit, that they can make a significant contribution to public education on recycling, and that they are not a packaged good like other materials in the recycling stream. ONP has value as a commodity traded on international markets and that value fluctuates which is a reason why the activity of recycling ONP should be cost neutral when systems are operated efficiently. On June 9, 2016, Bill 151 – An Act to enact the Resource Recovery and Circular Economy Act, 2016 (‘RRCEA’) and the Waste Diversion Transition Act, 2016 (‘WTDA’) - received Royal Assent. This new legislation - called the Waste-Free Ontario Act, 2016 - is designed to replace the Waste Diversion Act, 2002 (‘WDA’) with a new producer responsibility framework that makes producers individually responsible and accountable for their products and packaging at end of life. Under the new regime, all recycling programs will become fully-extended producer responsibility programs, with producers paying 100% of the costs and managing the system. The government has indicated that they will not be transferring the Blue Box program to the new system until 2023. News Media Canada's key goal is to ensure that the newspaper industry continues its existing in-kind agreement until that time. The in-kind contribution is distributed among the province’s daily and community newspapers allotted to the province’s 400+ municipalities so that they may use it to place free advertising to encourage recycling. The Ontario Ministry of the Environment was established in 1972, with the merging of the Department of the Environment and the Ontario Water Resources Commission. The Association of Municipalities of Ontario is a non-profit organization representing almost all of Ontario’s municipal governments and provides a variety of services and products to members and non-members. Resource Productivity and Recovery Authority: Proclaimed on November 30, 2016, as part of the new Waste-Free Ontario Act, 2016. RPRA replaces Waste Diversion Ontario, a non-crown corporation created under the Waste Diversion Act (WDA) in 2002 to develop, implement and operate waste diversion programs for a wide range of materials. Ontario’s Waste Diversion Act, 2002 requires all companies that introduce packaging and printed material into Ontario’s consumer marketplace (“Stewards”) to share in paying 50% of the funding of Ontario’s municipal Blue Box waste diversion programs. Under the new Waste-Free Ontario Act, 2016, this will increase to 100%. 1972 - Early Days: Newspapers were recycled as a public service as early as 1972 in a City of Toronto initiative. The Blue Box program began as a pilot project in Kitchener in 1981. 1997 – Provincial funding ends: With provincial funding ending completely at the end of 1997, municipalities had only recycled material revenues and municipal taxes to support the Blue Box program. 1998 – Province’s Blue Box Program requires industry to contribute: On October 7, the Minister of the Environment announced his plan for the Blue Box program. This initiative called on industry to contribute voluntarily. 2000 – Canadian Newspaper Association successfully negotiates a special arrangement for Ontario newspapers. Dailies and weeklies would be exempt from subsidizing the Blue Box program in cash. In lieu, they would provide in-kind advertising to promote waste diversion in Ontario. Newspapers are nevertheless required to contribute cash payments to bear the administrative costs of Stewardship Ontario (SO) and Waste Diversion Ontario (WDO) for the implementation of the in-kind program.Newspapers’ obligation increases. 2005 - The Government of Ontario enshrined the in-kind model for newspapers’ contribution, through an amendment to the Blue Box Program, thus ending several years of discussion led by municipalities. In enshrining the arrangement with newspapers, the Government of Ontario recognized the extraordinary success of newspaper recycling in the province. Recovery rates for ONP in Ontario have climbed to over 90%, easily one of the highest recovery rates in the world. 2007 - Canadian Newspaper Association's obligation was increased to providing municipalities an advertising insert promoting waste diversion in Ontario. Newspapers inserted an 8.5" X 11" flyer into one edition. 2016 - Bill 151 – An Act to enact the Resource Recovery and Circular Economy Act, 2016 (‘RRCEA’) and the Waste Diversion Transition Act, 2016 (‘WTDA’) - receive Royal Assent. This new legislation - called the Waste-Free Ontario Act, 2016 - replaces the Waste Diversion Act, 2002 (‘WDA’) with a new producer responsibility framework that makes producers individually responsible and accountable for their products and packaging at end of life. The fees per tonne formula that was established penalizes good recyclers; industry whose waste goes to landfill pays nothing toward the cost of the Blue Box. SO has increased News Media Canada's share of the administrative cost of the system. SO argues that the newspaper industry’s original assessment was too low - more time and effort than originally anticipated is required to cull and track data and this drives up cost. At the same time, other industries have been assessed downwards – this is a reallocation. The Ministry of the Environment is introducing Extended Producer Responsibility (EPR). In May 2011, the Recycling Regulation was amended to include Packaging and Printed Paper as a product category. In May of 2014, Schedule 5 of the British Columbia Recycling Regulation (B.C.) Reg. 449/2004 came into effect, requiring that producers of Packaging and Printed Paper (PPP) be covered under an approved stewardship plan. The PPP category includes newsprint as a type of “printed paper”. 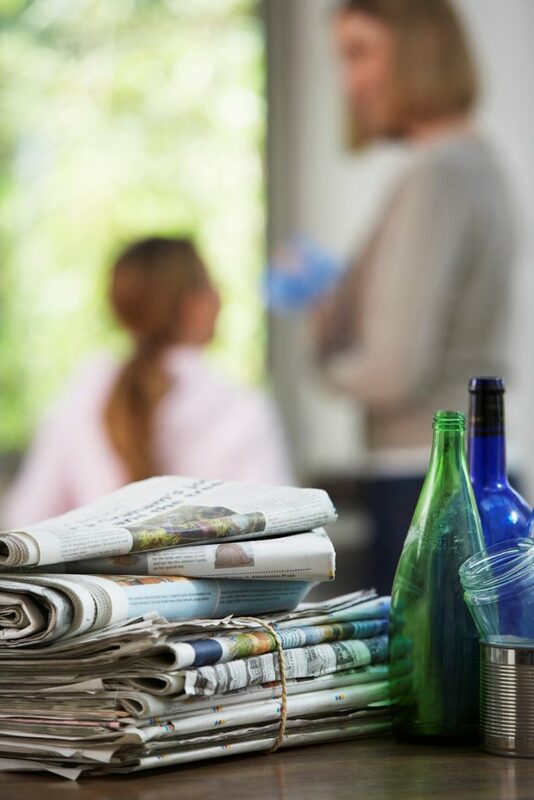 News Media Canada and BC’s newspapers have worked to produce a stewardship plan intended to address the interests of all stakeholders, and ensure continued high levels of newspaper recycling in BC. Click here to learn more about the proposed BC Stewardship Plan. comprehensive recycling plan in early 2010. However, this has been postponed. The industry portion (75% of the program costs) would be funded through an environmental handling fee on packaging and paper, while the municipal portion (25% of the program) could be funded through the existing recycling programming and capital assets. Saskatchewan Environment intends to move forward with a Multi-Material Recycling Program (MMRP). Under the proposed model, the MMRP will be operated by a “Stewardship Responsibility Organization” (SRO). The Packaging and Printed Paper stewardship regulation requires stewards to provide for 80% of the net cost of collection, processing & marketing the material, and cover the cost of government to oversee the program. In 1993, the Government of Manitoba agreed to deduct any future levies for recycling on newspapers from the Provincial Sales Tax (PST) collected on the sale of newspapers in the province. Until recently, the cost of recycling in Manitoba had been carried by the soft drink levy. Beverage producers have had the option of setting up a deposit-return system or of paying a 2 cent charge per container. All except beer producers have chosen the latter option. When the province sought to broaden the range of materials diverted from the waste stream, it anticipated that revenues from the soft drink levy would no longer suffice and it began exploring a Stewardship Model similar to Ontario’s in which industry pays 50% of the cost of recycling. In 2007, the Government of Premier Gary Doer reconfirmed that it would honour the 1993 agreement with the province’s newspapers and continue to exempt newspapers from recycling fees. As of April 2010, Manitoba commenced a Multi-Material Stewardship Manitoba (MMSM) program (www.stewardshipmanitoba.org - the site for stewards of the Packaging and Printed Paper Program in Manitoba). The Manitoba government once again confirmed that it would continue to honour the 1993 agreement and use the proceeds from PST to cover the cost of recycling. In Quebec, industry responsible for 50% of the cost of municipal waste diversion programs. Newspapers are required to make a contribution to municipalities’ recycling programs, and do so in the form of cash, as well as in-kind advertising space to promote waste diversion. Daily newspapers contribute an advertising credit of $10 per tonne of newsprint consumed (note: inserts etc. that are circulated with the papers do not count) in the form of an advertising credit valued at published open line rate. Nova Scotia adopted a Stewardship Model similar in many aspects to Ontario’s. The chief common denominator is that newspapers make an in-kind, not cash contribution. Recycling is managed through the RRFB (Resource Recovery Board), a non-profit corporation managed by a board of directors with representatives from the private sector and government. The credit to the RRFB assists RRFB Nova Scotia and the municipalities to educate the public about recycling issues. In 2001, the Nova Scotia Department of Environment and Labour (DEL) and the Nova Scotia Daily Newspapers signed a 10-year stewardship agreement, which was administered by the Nova Scotia Resource Recovery Fund Board Inc. The agreement expired on May 1, 2011. Municipalities use revenues from the sale of recyclable products like ONP to fund recycling programs and absorb the cost difference out of the tax base. Officials from these provinces have indicated while they are moving forward with recycling initiatives on a number of materials. However, they have no plans in the immediate future for a newspaper stewardship program.